Placental growth factor (PlGF) is a member of the vascular endothelial growth factor (VEGF) family, which binds to and signals through the VEGF-R1 receptor with tyrosine kinase activity that is important for the control of cell proliferation and differentiation. PlGF is predominantly expressed in the placenta, although it is also expressed at low levels in many other tissues including the heart, lung, thyroid, liver, skeletal muscle and bone. Alternative splicing generates four isoforms differing in size. 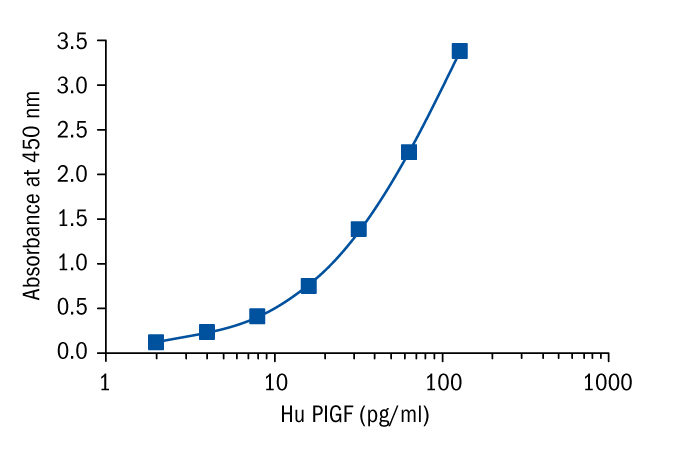 The primary difference between the four isoforms is that PlGF-1 and PlGF-3 are non-heparin binding diffusible isoforms, while PlGF-2 and PlGF-4 have additional heparin binding domains. PlGF-1 and -2 are the most abundant forms, and during pregnancy they are both secreted in a strongly correlated manner, indicating a common regulation mechanism. PlGF-1 and PlGF-2 consist of 131 and 152 amino acid residues, respectively. All PlGF isoforms are secreted as glycosylated homodimers. Placental growth factor is involved in regulation of placental vascular development during pregnancy. It has pro-angiogenic effects on the feto-placental circulation and supports trophoblast growth. Preeclampsia, a common hypertensive disorder of pregnancy, is characterized by reduced invasion of trophoblast cells and incomplete/inadequate transformation of the maternal spiral arteries. It may result in insufficient uteroplacental circulation and may be caused by an imbalance of angiogenic factors such as PlGF. In normal pregnancy, PlGF concentrations increase with gestation, peaking at 26-30 weeks and declining towards term. Several studies reported low circulating PlGF levels in serum and urine in preeclamptic pregnancies in comparison with normal pregnancies which is evident from the second trimester. Reduced PlGF precedes manifestation of the clinical disease and intrauterine growth restriction, thus, PlGF is an increasingly important molecule in prediction, diagnosis and treatment of preeclampsia. The main role of PlGF in tissues other than the placenta is angiogenesis in response to pathological ischemia or injury. In tumor cells, PlGF expression is part of the angiogenic switch that supports tumor vascularization. In most cancers such as renal cell carcinoma, colorectal, lung, gastric, breast and hepatocellular cancers, a positive correlation between cancer severity and PlGF mRNA expression and protein blood levels were observed, with an inverse relationship between PlGF and survival. Angiogenesis also plays a key role in atherogenesis and is intimately associated with inflammation and a variety of pro- and anti-angiogenic factors. PlGF was shown to be upregulated in early and advanced atherosclerotic lesions, and elevated circulating levels of PlGF were measured in patients with atherosclerotic or ischemic heart disease. In patients with acute coronary syndrome, high plasma PlGF level within 12 h of symptom onset was shown to predict a poor prognosis in short and long-term. Many studies indicate that PlGF might be a biomarker for atherosclerosis, particularly plaque instability, myocardial ischemia, and for prognosis of the patients with cardiovascular disease. Accelerated atherosclerosis is one of the consequential complications of chronic kidney disease and hemodialysis and PlGF levels in serum and urine have been described to be increased in these patients with decreased renal function.